There are many unreliable websites on the web and if you visit one of them, you might notice the pop-up message stating that Your Streaming Speed Is Slow. 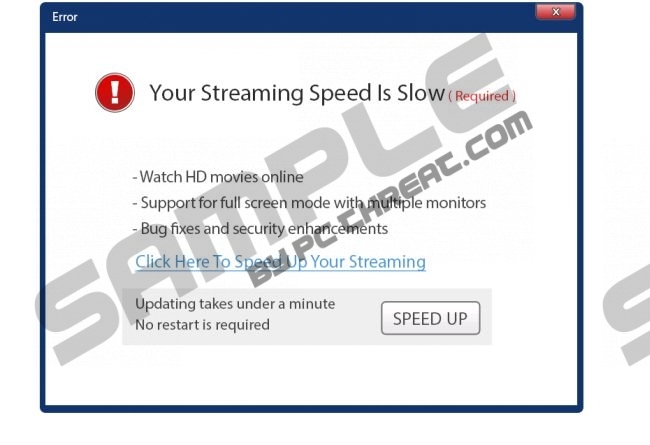 Luckily, this message is fake and it is only displayed for you in order to lure you into clicking on the “Speed Up” button, which will redirect you to another website where you will be offered to download a potentially unwanted program to “improve” your streaming speed. This fake message might appear on different websites regardless of the browser you use because it is compatible with Internet Explorer, Google Chrome, and Mozilla Firefox. As you can see, the message Your Streaming Speed Is Slow has been probably created by cyber criminals who expect to distribute malware. If you ever notice the pop-up message Your Streaming Speed Is Slow, you should not believe it and definitely not click on the button stating that it will help you to speed up your streaming. However, if you do so, you will notice that you are redirected to other website reimageplus.com. This website is the official website or Reimage potentially unwanted program. As you can see, this pop-up tries to convince you that Reimage might help you improve the streaming and lure you into downloading it and installing it on the system. We do not recommend doing that because there are many negative feedbacks about it. It is known that Your Streaming Speed Is Slow pop-up might be displayed by an advertising-supported program residing in your system; however, it is still more likely that you will meet it on random unreliable websites. In order to avoid different threats, it is better to keep the antimalware tool enabled all the time and if you still do not have one, we recommend that you acquire SpyHunter antimalware tool. If the message Your Streaming Speed Is Slow pop-up has already convinced you to download Reimage and you have it on your system now, you should know that you can always remove it. You will find the instructions below the article. Of course, you should also scan your system with a reliable malware remover in order to find out if there are no other serious threats existing on your PC. Right-click on Reimage or other undesirable software. Right-click on the background of the Metro UI. Click on it, select Uninstall a program. Quick & tested solution for Your Streaming Speed Is Slow popup removal.